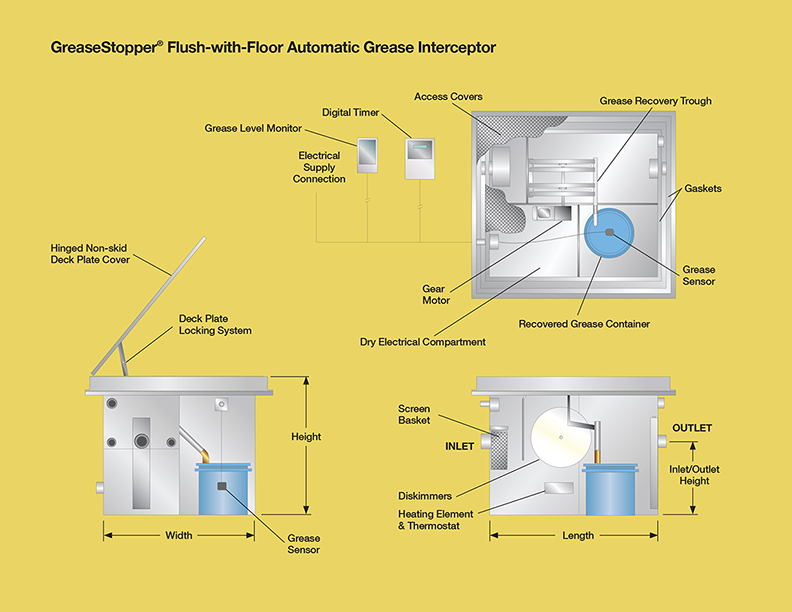 GreaseStopper® Automatic Grease Interceptors intercept and remove large quantities of FOG discharged from food service facilities and large commercial/institutional kitchens. They are suitable for aboveground or vaulted underground installations. They range in capacity from 15 to 800 GPM and incorporate and electrically powered grease-skimming device to remove accumulated FOG on a timed or event basis. Smaller, point-source units allow for installation under kitchen sink. Larger volume units usually installed in the building’s basement and service entire facility. Space-saving, ideal for on-slab installations. Includes a hinged access cover or easy maintenance. 15-100 GPM GreaseStoppers® are designed for installation under a sink or other limited space. The skimmed grease is collected in a waste disposal container for disposal or recycling. 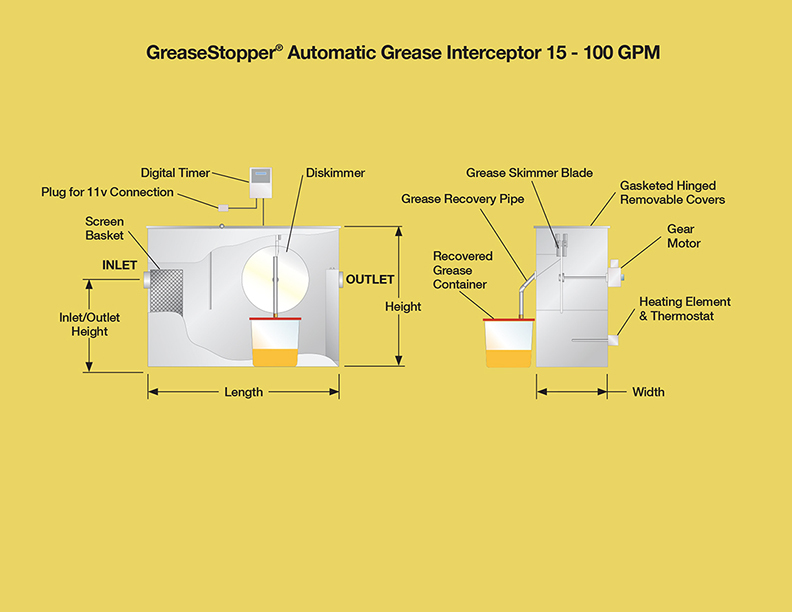 GreaseStopper® Automatic Grease Interceptors are designed to intercept and remove large quantities of fats, oils, and grease (FOG) discharged from food service facilities and large commercial/institutional kitchens. They are suitable for aboveground or vaulted underground installations. The larger volume, end-of-pipe AGI units are usually installed in the building’s basement and service an entire facility’s kitchen fixtures, including all floor drains. The Flush-With-Floor GreaseStopper® is recessed with its top flush with the floor in order to intercept kitchen fixtures and floor drains, save valuable above floor space and accommodate existing piping and structural conditions. 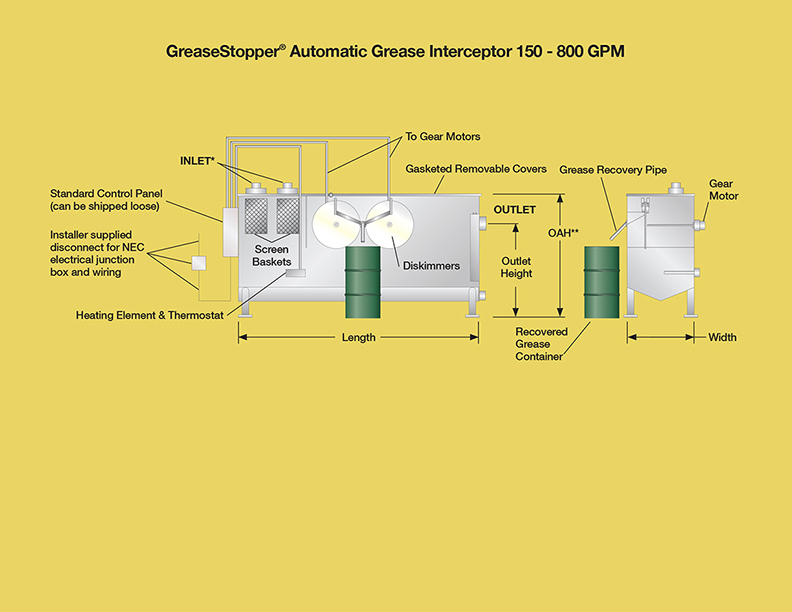 This specialized grease removal device features an integral Automatic Grease Interceptor with separate grease storage and dry electrical compartments. It is equipped with a hinge cover that opens to reveal the entire unit for easy maintenance. 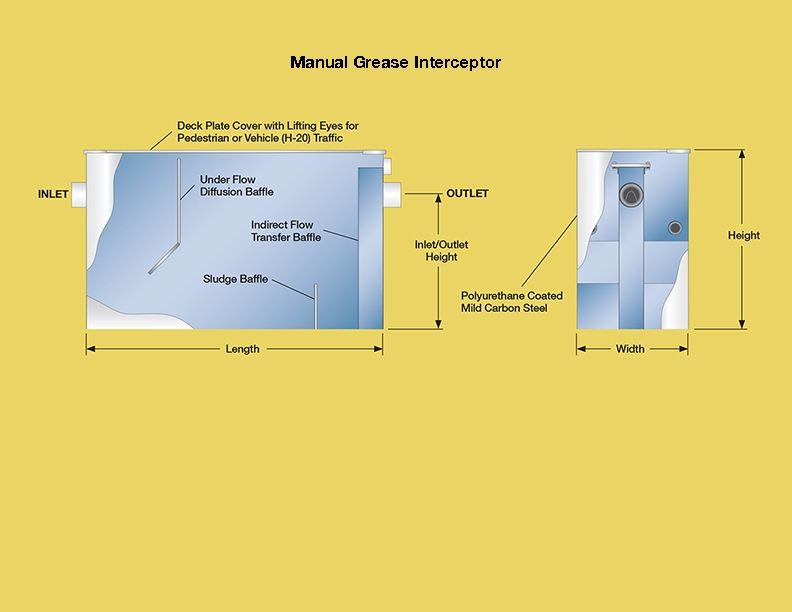 Manual Grease Interceptors are installed where they can be hooked up to a sanitary sewer that does not mandate an automatic grease recovery unit. The operation of the MGI is simple. Manual Grease Interceptors retain wastewater long enough to allow those contaminants with specific gravitiy different than water, to separate out by gravity flotation and settling.